Giovanni Aretino, in his life of St. Zanobius, a Florentine bishop, narrates that His Holiness gave away all his possessions to the poor and founded a community of monks at Passignano in 395. There is no historical proof of this, nor for the date 989 (or 899) associated with a certain Sichelmo as founder. The oldest records belonging to the Abbey are dated 891. The fact that the church is dedicated to St Michael suggests it was founded in the Longobard period. 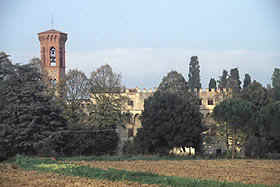 In 1049, the Abbey of Passignano was donated to St. Giovanni Gualberto. To understand the history of the Abbey fully, we must first make the acquaintance of the great Florentine saint, St. Giovanni Gualberto, founder of the Abbey at Vallombrosa whence the Vallombrosan Monks take their name. Giovanni, son of Gualberto, was born in Florence into a noble family in about the year 1000. During those tragic times of fratricidal strife he was still a young man, undecided whether to hate or whether to love mankind. A member of his family, possibly his brother Ugo, was murdered and, following the custom of the times, Giovanni was expected to take revenge by killing the perpetrator of the murder. The dramatic encounter took place in a narrow passageway outside Porta S. Miniato. Faced with his enemy, who, trembling, his arms outstretched in the form of the cross, beseeched mercy, Giovanni cast down his sword, dismounted his horse and granted forgiveness. He then went up to the church which stood not far from where he was and knelt before the crucifix. The story goes that the Christ on the Crucifix nodded his head as a sign of approval. Because of this act, Giovanni was thenceforward known as the Hero of Forgiveness. After this episode, Giovanni, overcoming his father's strong objections, decided to retire to the Benedictine monastery next to the church of San Miniato al Monte. His indomitable spirit as a knight also inspired him as a monk and came to the fore when the time was ripe to defend the church, corrupted above all by simony. His burning evangelical zeal was turned against the Abbot of that very monastery and also the Bishop of Florence, Pietro Mezzabarba, both of whom were simonists. Powerless to remove them from office and refusing to debase himself by compromise, he decided to withdraw and live in solitude. He left the monastery of San Miniato and, after travelling widely, reached Vallombrosa. Other monks and youths, drawn by his personality and saintliness, followed San Giovanni Gualberto and in this way the new fraternity at Vallombrosa came into being. Desiring to live a monastic life based on the rules of the Benedictine order, Giovanni bound the community to a life of strict poverty, prayer, brotherhood, hospitality and toil. The monastic reform which was practised at Vallombrosa was the chief life work of St. Giovanni Gualberto. In addition to the monks who went forth from his school and the foundation of new monasteries, he made a great contribution to a wider movement of ecclesiastical renewal of monks, clerics and laymen. During the life of St. Giovanni Gualberto, many of his most cherished disciples were sent to Passignano. Among them were Leo the Abbot (of the Conti Guidi) and the young Pietro Aldobrandini, later Cardinal of Albano. Abbot Leo restored the ruined monastery. Outside it he had the church of St. Biagio built for the parishioners. He was present at the Roman synod in 1050 and arranged the encounter between Pope Leo IX and Giovanni Gualberto at Passignano. The Prior of Passignano, Pietro, was then named "igneus" because he walked unharmed through fire at Badia a Settimo on Ash Wednesday, 13 February, 1068, forcing the simonist bishop of Florence, Pietro Mezzabarba, to leave the city. At this time, the Abbey of Passignano already owned hospices and hospitals and its influence extended from the parishes of Sillano, Campoli and Cintoia to the Valdarno and the gates of Siena. On 12th July 1073, in the monastery of the Abbey of Passignano, the life of St. Giovanni Gualberto drew to an end, although not before Ildebrando become Pope. He was the very monk, who, alone against the Roman synod in 1067, had defended the monastic ideals of Vallombrosa. Known as Gregory VII, he gave his name to the Vallombrosan reform which came to be called "Gregorian reform". The destruction of Fiesole by Florence in the 12th century had a profound influence on the life of the Monastery. The Florentines, who feared heavy punishment by Pope Onorio II, turned to the Abbot of Vallombrosa, St. Atto, in order that he might intercede with the Pope in their favour. The Holy Abbot promised to intervene on condition that the Bishop of Florence ceded to the Bishop of Fiesole the parish of Sillano to which Passignano belonged, in exchange for some land belonging to Fiesole in the Mugello. This separation from the diocese of Florence forced Passignano to follow the political leanings of Siena. 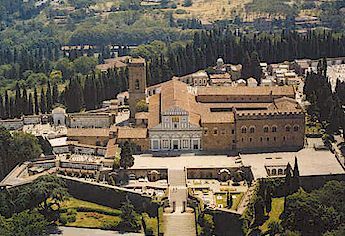 When eventually the Bishop of Fiesole, forced to take up residence in Florence, tried to transfer his seat to Figline in order to free it from the yoke of Florence, the church of San Lorenzo was purchased by the Abbey of Passignano to be used as a cathedral. But the Florentines destroyed Figline and set fire to it. The Alberti family planned to build not a castle but a whole town to defend against the Florentines, and this was Semifonte. 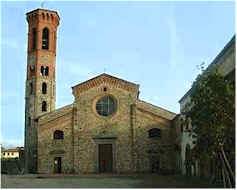 Passignano contributed to this plan by building a church and a hospital. In 1196 the Florentines destroyed the buildings at Passignano and several years later razed it to the ground. In 1255 members of the Florentine family Scolari set fire to the monastery, but although it was severely damaged, the church was saved. In 1266 Ruggero Buondelmonti was appointed head of the community to keep away the Scolari family and to reconstruct the ruined buildings. Work on this continued to the end of the century. We can still read the name Buontalenti with the date 1287 inscribed on one of the church beams. Abbot Ruggero also took part in the conclave at S. Trinità where the elevation of Charles of Valois was decided and consequently the exile of the Guelfs (including Dante). In 1312 the Emperor Henry Vll occupied first the Monastery of S. Salvi in Florence then later moved to Chianti and occupied the Monastery of Passignano. On this occasion the monks, threatened with destruction by the Imperial troops, made a vow to the Virgin to celebrate every year the Feast of the Immaculate Conception on December 8th in order that the monastery might be saved. The vow was fulfilled the very same year. In spite of these vicissitudes in the 14th century, two major works of art were created in Siena: the reliquary of St. Giovanni Gualberto, which was completed in the next century, and an altar piece for the main altar by Jacopo di Mino (1358) (unfortunately lost). In 1365 St. Caterina of Siena wrote two letters to the Abbot Martino and one to the monks of Passignano begging them to choose to die rather than fail to fulfill their monastic vows. In the Renaissance period, the Abbey flourished thanks to two Florentine abbots, Francesco Altoviti (1440-55) and Isidoro del Sera (1455-85), who renovated many parts of the buildings and built several large rooms. The Refectory which we see today with the Last Supper by Domenico Ghirlandaio belongs to this period. The community consisted of about 30-35 monks, many of whom were young novices and students. However, even during the full flowering of the Renaissance, difficulties due to strife within the church, which involved the Abbey of Passignano, were not lacking, and the Abbey was unable to avoid the ruinous system of the commendam. In 1487, Lorenzo Il Magnifico succeeded, through Innocent VIII, in entrusting the Abbey in commendam to his son Giovanni, the future Leo X, to whom the monks were obliged to pay two thousand fiorins per year. 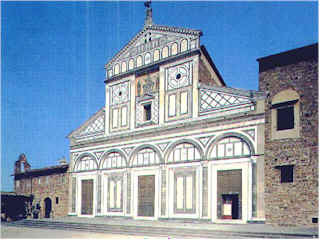 Moreover on 24th December, 1515, Passignano lent its tapestries to decorate the church of Impruneta for the Papal visit. At the end of the 16 C, it was planned to complete the Renaissance building with the reconstruction of the church. Domenico Cresti, the local painter known as "il Passignano", made a great contribution to this work. The events of the 16th century also had a great influence on the history of Passignano. The Spanish, who occupied Florence in 1530, defeated the French in 1565 and occupied Siena as well. The territory of Siena was annexed to that of Florence, and consequently the centre of political, military and economic power was transferred and the monastery of Passignano no longer had the strategic importance of previous centuries. In the 18th century the monks at the Abbey, anxious for reform, became involved in following the ideas of Bishop Scipione dei Ricci who ended his life at Rignana,near Passignano and was buried there in the family chapel. S. Giovanni Gualberto was buried at Passignano and the monastery always enjoyed a privileged place in the Vallombrosan Order. For many centuries the Abbey was the seat of learning for every branch of science "where it seems (according to Franchi) that knowledge has, up to now (1640) sustained the pillars of the seven liberal arts." In its library there was a collection of more than six thousand documents which the Grand Duke Pietro Leopoldo ordered to be added to the 140,000 belonging to the archives of Florence. The writings in Greek and Hebrew in the wooden choir of the church bear witness to the monks' knowledge of Oriental languages. In 1587-8 the chronicles of the monastery mention the presence of Galileo Galilei who, having studied in the Abbey of Vallombrosa when he was a youth, returned to visit his old teachers and at the same time devoted his attention to teaching the young monks. In the middle of the 18th century, a Vallombrosan monk by the name of D. Leto Guidi, built all kinds of telescopes at the Abbey of Passignano, and which were set up in various places in Europe. On 10th October 1810, under the Napoleonic suppression, monastic life at Passignano was temporarily suspended. A large part of the art and literary treasures were lost. Houses and land were rented out - 40 farms and 80 farmhouses, apart from the monastery itself. At the restoration in 1816, Grand Duke Ferdinand III re-instated the religious communities but only the monasteries of Vallombrosa, S. Trinità and Montenero were assigned to the Vallombrosan order. In 1818 the monks, by paying a little at a time, repurchased the Abbey of Passignano and its estate and set up a small community once more. It was not till 1858 that it was possible to re-install the Abbot and increase the numbers of the community. But the life of the community was not to last long. In 1866, the reigning government again suppressed all the religious orders and confiscated the whole property of Passignano, including the monastery, with the exception of a small part which was left to two monks who were to act as custodians of the church and parish. On 7th October, 1870 the Abbey of Passignano and all that belonged to it (39 farms with 1264 hectares of land) was put up for auction and sold. A long period of quiet and silence but also of transformation for the Abbey began in this way. The name was changed and it was no longer the Abbey, but the Castle of Passignano. New architectural features were added to make it look like a castle. At the beginning of this century, a visitor wrote the following: "The Abbey of Passignano used to be an austere community dedicated to the Saints, in which the discipline and sackcloth mortified the flesh of the monks; now it is a pleasurable residence, an elegant and even majestic castle". Before concluding with the last historical event that affects us, I would like to relate something which was written by a monk who resided at the Abbey at the beginning of the century: "Such were the principal vicissitudes of this illustrious monastery under the double suppression of Napoleon I and the Italian government. May the Lord grant that the century which has just begun be happier for the Abbey and for the Vallombrosan monks than the last one and may He bless the sons of Giovanni Gualberto, custodians of his proud sepulchre, that they may follow in the glorious steps of their forefathers". The Vallombrosan monks had long desired to return to the Abbey at Passignano and various attempts had been made in past years but only in 1986, after 120 years, was it possible, thanks to the goodwill of several people and the real, tangible assistance of San Giovanni Gualberto, for the monks to return to the ancient Abbey of Passignano.